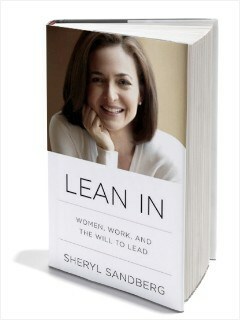 Lean In by Sheryl Sandberg is the ‘It’ book for women right now. I like to think of myself as a hip person (which is obviously not true since I just used the word “hip”) so I had to read it. Ok, I actually read it because my curiosity was piqued by the range of reviews – it’s great, it’s bad, it blames women too much, it is too idealistic, etc, etc, etc. My high-level review of the book is that I would give it 5 stars as an introduction to a topic that requires more depth. Sandberg keeps it high level and shies away from getting more specific about how women can really “lean in”. What I’m hoping is this book is just a starting point for a more detailed discussion about women in the workplace. The two most important points of the book for me were that: you still have to pursue the opportunity and women are too hard on each other (this isn’t a new learning for me, but it is always a good reminder to work against this phenomenon). Connections are important, but you still have to do the work and pursue the opportunity. It is easy to dismiss Sandberg’s success and, therefore, her advice because 99.9% of women can’t relate to her life. She is COO of Facebook and probably makes more money in one year than the average reader makes in 10 years. (sidenote: I just looked it up – her salary + bonus is probably 10x, but her stock options are akin to winning the lottery) She has ‘made it’ – and she did so with an Ivy League education and a lot of connections along the way (seriously, who works at the White House while they are still in High School?!). The reality is these are not good reasons to dismiss her advice. She is where she is today because she was willing to leverage those connections and, most importantly, to put in the hard work along the way. Her connections and education opened the doors, but she still had to come up with the ideas and do the work that made her successful. Networking and connections are very important, which I talked about in my last post (way back in February — don’t judge, I’ve been busy!). But, they are like a resume. They will get you an interview and maybe a job, but they won’t make you good at the job. That is up to you. I think the more important point she makes in this part of the book is that women tend to make career decisions in anticipation of future events, rather than waiting to see how events unfold. You need to build a good, authentic network and work hard, but first you have to be willing to even pursue the new opportunities. Women have the tendency to go for roles they believe will fit better with married life or family life. She provides an example where one female was worried about this before she had even had a boyfriend! The point she makes is: don’t limit yourself based on assumptions of what it will be like, because you don’t actually know until you try. I’ve worked with some amazing women leaders who also balance a family. It is hard and requires a lot of support from their husbands and family, but they make it work. Women need to stop being so hard on each other. This is so true. This topic is worthy of having its very own chapter in the book. Sandberg covers two main competitions between women: as rivals in the workplace and the mommy wars. In the first part of the chapter, Sandberg discusses and gives examples of women who undercut each other because they think there is only room for one of them to move up the ladder. I can honestly say I haven’t experienced this kind of female rivalry in the workplace. This could be due to the fact that, up until last month, I worked in a very male dominated function or because I tend to seek out people who have a more positive attitude. I don’t want to dismiss her examples because I’m sure this is true in some environments, but I’d say the rivalry for promotions is not gender specific. In the second half of the chapter, Sandberg discusses the divide between mothers who work outside the home and mothers who work inside the home. Once a day, I can count on an article in my Facebook news feed making one of these points: I’m not a bad mom for working outside the home, working inside the home doesn’t mean I just sit on the couch all day, people without kids don’t understand my life as a parent, and people with kids judge my decision not to have kids and don’t take my life seriously. If there isn’t judgment being passed about work choices, then it’s parenting decisions. I’m quite frankly amazed that we don’t have more criminals among us because that is obviously what the wrong sleep strategy or food regimen will create. I’ll add a third group to what Sandberg discusses: females who aren’t mothers. I don’t have kids, but I have experienced the mommy wars. These are some of the most memorable comments I’ve received personally – “you want someone else to raise your kids so you’ll send them to daycare”, “it’s a fact that kids with two working parents just don’t turn out to be good kids.”, “you will change your mind about your career when you have kids.” Keep in mind that I don’t even have kids and people already have opinions about my parenting decisions that I haven’t even made… because, like I said, I don’t actually have kids (but I do want kids, if that counts). I’m sure these people believe they’re somehow preparing me for parenthood or giving me a different perspective to consider (or they really are just preemptively calling me a bad parent… who knows). To tie my tangent back to Lean In, Sandberg concludes the chapter by suggesting that women take life decisions made by other women too personally. I know this well and I’m sure there are a lot more women out there nodding their heads in agreement now. If a woman decides to work at home, it isn’t a reflection of what she thinks about the mom who works outside the home (or vice-versa). If a woman is happy being really good at her job, rather than striving for a CEO position, that decision should be supported and appreciated. The general message is this: rather than finding fault with one another, why don’t we seek to learn from the strengths of one another? Am I contributing my ideas? Am I building constructive, rather than destructive, relationships in my career and life? Investing in your network is investing in yourself. Fair or not, personal connections matter. People like to help someone they know and they like to know the person they’re helping (especially if they’re going to stick their neck out for you). The last time I applied for a job posting I randomly found on the Internet was 10 years ago. It was a part-time job in college as a Customer Service Representative at Ecolab. Since then, all of my jobs have been obtained through personal connections. I’m sure that makes me sound very lucky or like someone who is a natural at networking, but the truth is there is nothing out of the ordinary about me. In fact, I don’t like chitchat and I get nervous when approaching people I don’t know. That is why I work in Operations and not Sales. But, you get creative really fast when you’re a college kid staring down $50k of student loans (and that is just from my undergraduate – what a lucky guy my husband is!). I started seeking out people for advice because I wanted to know one thing: How do I get a job after graduation so I can pay off my student loans? What I’ve discovered since then is networking is actually very easy and anyone can do it well if they just stick to the basics. Rule #1: One-on-one is the most effective way to build a strong network. I’ve never had any luck at the large events where you wonder if it’s a networking event or cattle call; and you walk away with 15 business cards but no real connections. It is better to meet with someone one-on-one because it is more personal. You don’t have to worry about being interrupted by anyone else and you can pick the time and location. You will also feel more comfortable talking about your experience and asking questions, and they will feel more comfortable providing honest feedback and advice. Rule #2: You need to ask for a meeting in order for it to happen. Simple, right? Wrong. This is the part people seem to dread the most, but if you don’t ask it won’t happen. Sometimes people will say no, but most people will say yes because it’s flattering to be asked for advice. How do you set up the meeting? You figure out if you want to target someone at a certain company, in a certain field, with a certain degree, etc. Then, you find someone to introduce you. That could be a friend, family member, old classmate, or even a Recruiter. Email introductions allow you to think about your wording when you introduce yourself so this is the method I usually prefer. Rule #3: Don’t only network when you need it. You should always strive to make personal connections for a few reasons: it’s a good way to learn about different areas in business, new people bring new perspectives to your life, and it makes it easier when you do need help. I’ve found new opportunities through old classmates, people I’ve met at trainings, and casual work acquaintances. I didn’t intend to meet these people because I thought they might be able to help me at some point. I met them because I was genuinely interested in learning about what they do and where they work. In most cases, they reached out to me when they learned about an opening they thought I’d like. If you only network when you need it, you risk missing out on bigger opportunities that might come up when you least expect it. Rule #4: Stick to the purpose of the meeting and stay positive. Meeting new people to learn about their job or company isn’t the time to trash your employer or boss. It isn’t even the right time to dwell on personal struggles too much. The purpose of your meeting should be to learn about the person you’re meeting with, share your story, and get advice. You want to give the impression that you have a good outlook on life, have turned your life challenges into motivation, and are easy to get along with. Rule #5: Return the favor. If someone wants to meet with you about your job or company, return the favor. It’s only polite. In addition to these basic rules, you should follow standard etiquette you’d follow with an interview: be on time, send a follow-up thank you email for their time, be prepared to talk about yourself, and ask good questions. Networking or informational interviews shouldn’t feel like an interview, but it is respectful to be prepared with questions and what you want to get out of the meeting. On the flip side, networking is also a good way for you to see if a company culture, department or boss is someone you wouldn’t want to work with. When I was finishing my MBA, I met with a guy in Strategic Business Development at a large local company for coffee to learn about his job. The guy was 15 minutes late and had that slicked-back hair look about him. He referred to my experience as “back-office” and didn’t seem engaged in anything I had to say. I was so put off by him that I didn’t even apply for the job. What have you found to be the most effective networking approach? Do you have an awkward networking story you’d like to share? Managers have bad days too. Prior to managing people, I had strong opinions about how I would handle situations differently (so much better, of course) and what I was owed. After four years of managing teams that have ranged in size from 2 people to 100 people, my perspective has changed. In some cases, I would have cut my manager more slack. In other cases, I would have demanded more. I tried to summarize my reflection into 3 things I would tell my non-manager self. 1. Managers have bad days too. Some days, the political jockeying or finger-pointing is too much. When this happens, we’re not short with you because we’ve decided you’re a bad employee; we just want to hide in our office with a bag of Cheetos and hammer through that power point that is one week overdue. Maybe someone just yelled at us, or maybe we lost our temper and yelled at someone else. Or, maybe we’re just in a funk. Today, I was emotionally tapped out by noon. My biggest victory was that I didn’t go for the Cheetos until 5:00pm. Days like this are rare and I try to compartmentalize so I don’t take it out on my employees; but sometimes it’s tough to fake enthusiasm. My caveat to this is that attitude is one of the most important factors of success. Your manager shouldn’t be having a bad day every day. This pertains to employees too. You don’t need to be Susie Sunshine, but you do need to have an open mind. If you’re frustrated by a process, think about what is needed to improve the process rather than just complain about it. If you feel like other groups aren’t good at sharing information, be the first to reach out to discuss how you can work better together. Or, if you think other groups are just plain terrible at their jobs (and maybe life in general), try to understand if it is really them or if there is something else going on. Chances are, they are dealing with bad process, unclear roles and responsibilities, or poor morale. Dig in and figure out how you can be part of the solution. 2. Good managers will be invested in your performance and job satisfaction, regardless of your career aspirations. There are three kinds of employees: promotable, valued contributor, and needs development. I’m sure I’ve been in each category at one point, but I’ve only had a few managers make it a priority to have the discussion with me regularly. As a result, other managers were very surprised when I turned in my notice because, apparently, I was highly valued. How was I supposed to know that if I wasn’t being told? You and your manager should be discussing where you fit at least 1-2 times a year, including what you want to get out of your current role. Do you want a promotion? Are you happy in your role, but you want to take on more responsibility? Do you want better work/life balance? This is a two-way street, so if your manager hasn’t initiated the discussion you should set up the first meeting. Your manager should be prepared with feedback. If this doesn’t happen, press for it. You deserve it. On the flip side, your manager should be very honest if you aren’t doing well. You should know specifics about what isn’t meeting standards, actions you need to take to fix it, and the timeline. You deserve the chance to improve and your peers deserve to have a team full of equally contributing people. I strongly believe addressing performance issues isn’t just for the benefit of the employee having the issues, it’s for the benefit of the entire team. We’ve all had coworkers we think aren’t pulling their weight, and our second thought has probably been, “Why isn’t my boss doing anything about it?”. 3. We know more than you might think, and (sometimes) our decisions are based in logic that isn’t easy to see. This applies to a lot of areas: poor performers, what our employees do on a daily basis, big changes that might be coming, etc. I had a boss I was certain kept piling work on me because he was ‘buddies’ with my coworker. It made me so mad that I actually took a different job within the company. In retrospect, he was trying to stretch me to take on more responsibility because he had confidence in my abilities. Even if his intention really was to help out his buddy, I’m the one who ultimately benefitted from being stretched. Managers won’t know everything their employees do on a day-to-day basis. If they do, they’re micromanaging or not focusing on the best things for their team. However, what they should know is their empoloyee’s skills and how those might be causing frustrations in their job or how those skills can be used to benefit the team. If someone doesn’t have a high attention to detail but they have a highly analytical job, it is the manager’s job to recognize that and help their employee work through it. Chances are, the employee also has skills that make them successful in other aspects of their role. They might not be great with details, but they’re good at building relationships or they bring good ideas out about how a process could be improved. Employee issues are an area it is (or should be) easy for a manager to figure out what is really happening. Since the team’s work is a reflection of the manager, it’s rare that a manager doesn’t see a performance issue. Your lazy coworker? He could be on a performance improvement plan, but that isn’t exactly something we can share for ethical reasons. My caveat to point #2 is your manager should address performance issues, but you won’t know they are addressing it (if it isn’t you). Try to be patient. My non-manager self would probably have advice for me too. I’m sure it would relate to fairness and spending time understanding my employee’s daily responsibilities. Or maybe it would mostly be about giving big raises. A new kind of sadness.